With the PAF confirming its order for S-70i Black Hawks, all we can do now is wait for the 1st batch this year. Looks like a certain group is asking for new aircraft! MaxDefense will discuss more about this in its next blog entry coming soon! The PAF may have accidentally leaked evidence of having Joint Direct Attack Munitions (JDAM) smart bombs in its inventory. Another big thanks to Japan! From Naval Air Group to Naval Air Wing? The Philippine Navy's Naval Air Group aspires to be upgraded into an Air Wing. 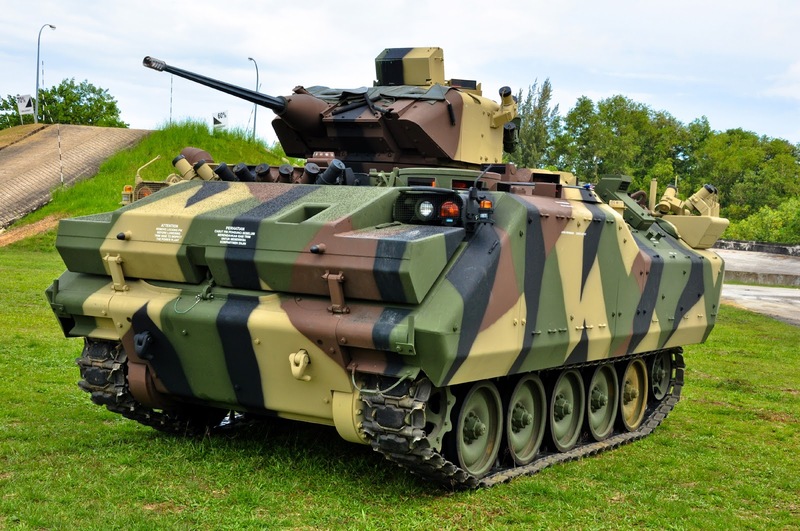 In a bid to improve its firepower delivery capability, the Philippine Army's Mechanized Infantry Division (PA MID) has embarked on several upgrade projects for its existing fleet of armored vehicles. Currently PA MID has an ongoing project called the M113 Firepower Upgrade project under the Horizon 1 phase, contracted to Israel's Elbit Systems Land & C4I, which improved the weapon stations of the M113A2 tracked armored personnel carrier by having 44 existing vehicles installed with the company's Dragon 12.7mm Overhead Remote Control Weapon Stations (ORCWS) and other related equipment and computer systems, while converting 5 other existing vehicles into Armored Mortar Carriers armed with the Soltam Cardom 81mm Recoil Mortar System (RMS). Another project that was only recently finalized is the Horizon 2 phase's M113 Mortar Carrier Upgrade contracted also to Elbit Systems Land & C4I to supply 15 refurbished M113A2 tracked armored personnel carriers converted into Armored Mortar Carriers armed with the Soltam Cardom 120mm Recoil Mortar System (RMS), and also providing an upgrade kit to convert the 5 Soltam Cardom 81mm RMS from the M113 Firepower Upgrade project into 120mm mortars. In this blog entry, we will discuss another PA MID project that is part of the Horizon 2 phase of the Revised AFP Modernization Program (RAFPMP) that we are expecting to move in the next couple of months - the M113 APC Firepower Upgrade (not to be confused with the earlier M113 Firepower Upgrade from the Horizon 1 phase). The FNSS ACV-300 (now ACV-15) with a M242 Bushmaster 25mm gun on a BAE-FNSS Sharpshooter one-man turret. Photo taken from FNSS' website. The Philippine Army currently has a small fleet of Turkish-made ACV-300 (now ACV-15) Advanced Armored Personnel Carrier (AAPC) acquired from Turkish company FNSS. 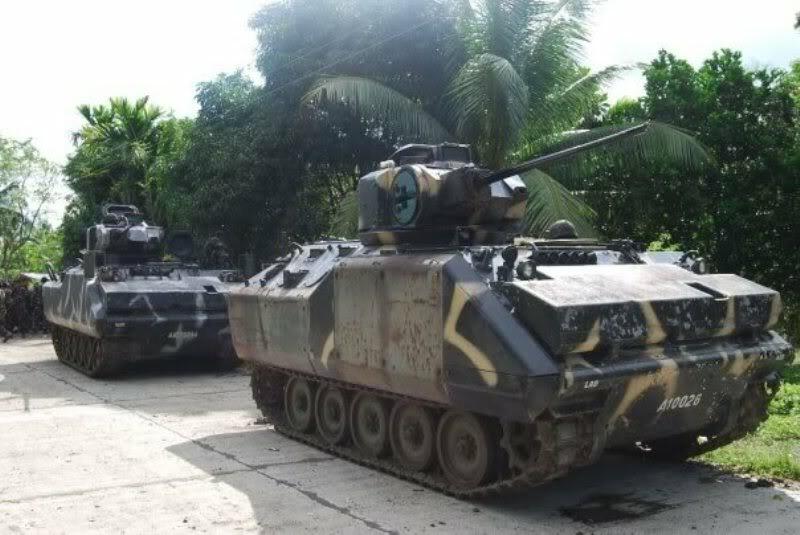 These vehicles were acquired less than 10 years ago under the old AFP Modernization Program covered by RA 7898, and are considered to be the youngest armored vehicles in the Philippine Army, despite the procurement made before those assets acquired during the Horizon 1 phase. Six (6) units were acquired from FNSS, are was supposed to be the first batch of a proposed new fleet of new tracked armored personnel carriers for the Philippine Army. While the performance of these vehicles were great, the Philippine Army realized that they are in need of hundreds of armored vehicles, yet their budget is only good for a few dozen. Instead of purchasing more ACV-300s from FNSS, the Philippine Army decided to use the budget to acquire upgraded M113A2s (which were contracted to Elbit Systems Land & C4I), and to request the US government for used M113A2 tracked armored vehicles under the US Excess Defense Articles (EDA) program. Part of the funds for the new APCs were used for logistics, repair, and shipping 114 M113A2 armored vehicles from the US to the Philippines. 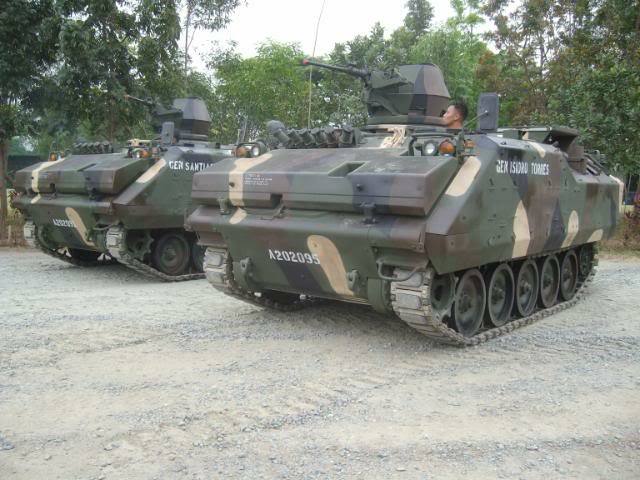 Some of the Philippine Army's ACV-300 tracked armored personnel carriers made by Turkey's FNSS. These are planned for conversion to Infantry Fighting Vehicles. Photo taken from old Timawa.net forum. While the ACV-300 appear to be similar to the M113 series of tracked armored vehicles, it is in fact closer to the FMC Armored Infantry Fighting Vehicle (AIFV), more commonly known as the YPR-765 after the Dutch examples, which has some minimal improvements over the M113 family, like additional armor, sloped rear section, and enclosed turret/main weapon. The PA MID ACV-300 tracked APCs are armed with an 12.7mm M2 heavy machine gun on an armored ACAV main mount. Aside from the six APCs, the PA MID also has 1 unit of Armored Recovery Vehicle acquired separately under an earlier deal. 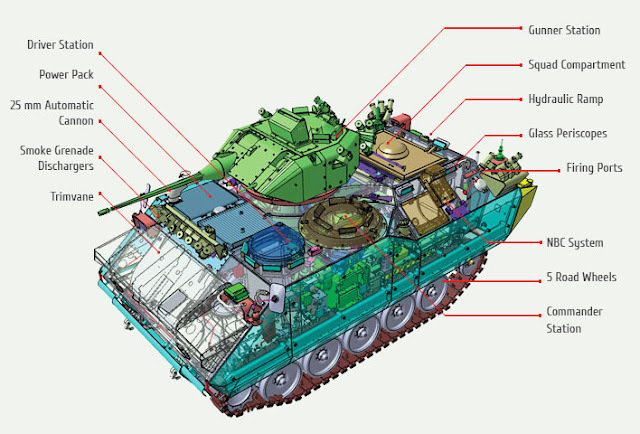 A cross-section of the ACV-300 (now called ACV-15 by FNSS), in this case with the Sharpshooter turret armed with M242 Bushmaster 25mm gun. Photo taken from FNSS website. 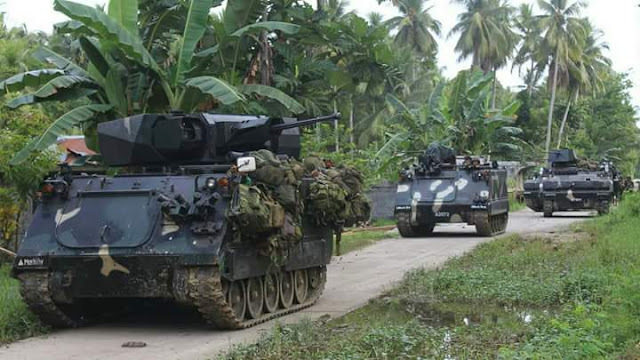 When the PA MID originally proposed the M113 APC Firepower Upgrade, the original plan was to install the M134D Minigun 7.62mm Galting gun to at least 32 units of M113A2 and ACV-300 tracked armored personnel carriers, with a proposed budget of Php288,000,000.00. Prior to this, the Philippine Army actually requested for the procurement of at least 8 M134D gatling guns as an emergency procurement for installation on the M113 fleet, while the Battle of Marawi against Maute terrorists was happening. The Marawi campaign ended without getting approval for this emergency procurement plan. Instead of forgetting the plan, the MID decided to request for more M134s Miniguns and not settle for just 8 units. The original plan was to acquire the M134D 7.62mm gatling gun and install them on at least 32 units of M113A2 armoured personnel carriers. The experiences from the Marawi crisis made military planners change their plans. But changes were made by the MID's Procurement Board after the AFP released its collection of learnings from the Battle of Marawi in 2017, when the MID used several of its newest assets including the M113A2+ Infantry Fighting Vehicle armed with the 25mm gun mounted on an Elbit Systems UT25 unmanned turret. Among the learning made during the conflict was that the 12.7mm heavy machine gun as well as all other smaller gun calibres are practically ineffective in urban warfare, especially in penetrating concrete walls or structures that the enemy uses for protection. 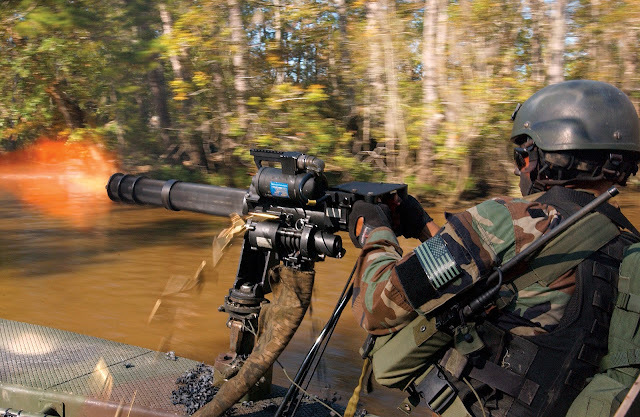 This is the same for the M134D Minigun. While the rate of fire is impressive, the machine gun's munition cannot penetrate brick/block and concrete walls and structures. 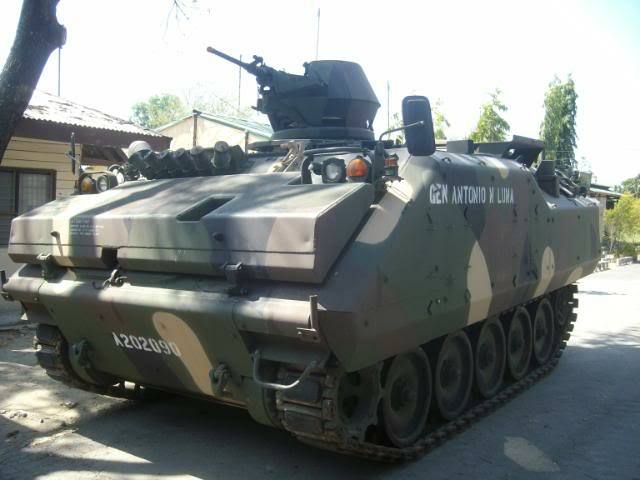 One of the Philippine Army's older M113A1 armored personnel carriers tested with an M134 7.62mm Gatling gun. Results from these previous tests from several years ago were said to be not favorable, with the Philippine Army deciding to retain the standard M2 12.7mm heavy machine gun due to its greater range and power, as well as the M134's use of considerable amount of ammunition. Photo taken from old Timawa.net forum. 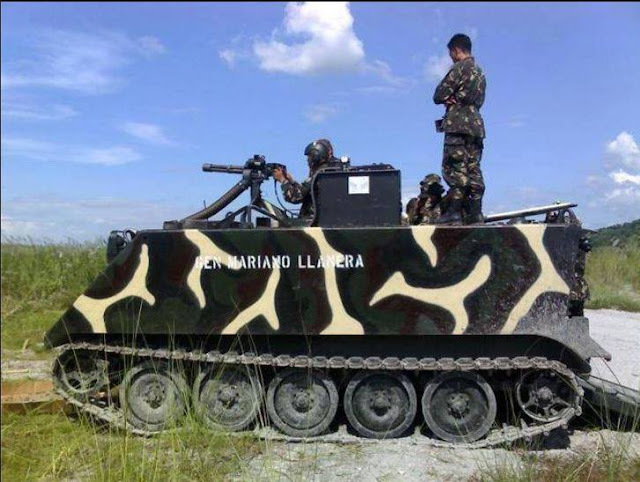 The Philippine Army also tested their newly acquired M113A2 IFVs armed with the 25mm guns on UT25 turret, and found them able to penetrate some, but not all concrete walls. But the difference with the 7.62mm and 12.7mm machine gun rounds is very apparent. While the learnings lean more on going for a larger calibre gun than the 25mm, economies of scale kicks in since the Philippine Army does not have other quick-fire medium calibre guns in service aside from the 25mm (which are found on the AIFV, M113A2 IFV, and Simba IFV). While the 30mm calibre is desired, it was decided to stick to 25mm instead, although options to move to the 30mm round in the future will be made open. Going for a 25mm gun means requiring for a turret mount to be used, instead of just an armored cupola. In this case, the Philippine Army has two (2) options: either going for an unmanned turret similar to the Elbit Systems UT25 turret installed on the M113A2 IFV, or it can go for an electrical-powered manned turret similar to the one installed on the AIFV YPR-765. Based on proposals submitted to the Philippine Army TWG, the unmanned turret option is obviously more expensive than the manned turret, although the cost difference is not too far from each other despite the extra cost for the electronic weapon station to control the gun and turret. But it appears that there were also learning from the Battle of Marawi campaign wherein pros and cons of both manned and unmanned turret were realized. MaxDefense will defer discussion of these learning for lack of authorisation to do so. But we can safely say that manned turrets have their own benefits over unmanned turrets, and that is among the reasons why the Philippine Army TWG decided to recommend the use of manned turrets. Two AIFVs with manned turrets (top), and an M113A2 IFV with the UT25 unmanned turret (above) during military operations. Both options were considered for the M113 APC Firepower Upgrade project. Credits to original source of both photos. With the decision to go for manned turrets, there are a few who are possible suppliers for such products. Among those expected to have submitted their proposals include Turkey's FNSS, being the manufacturer of the ACV-300 vehicles, and other companies who had experience working with the Philippine Army like Elbit Systems and IMI Systems, and and other newcomers like Italy's Oto Melara - Leonardo, Israel's Rafael Advance Systems, South Africa's Denel Vehicle Systems among others. MaxDefense believes that FNSS and Elbit Systems, as well as IMI Systems (which is now part of Elbit Group of Companies) have the best chance of bagging the project. Currently FNSS is expected to offer the BAE Sharpshooter 1-man turret, which is currently the standard 25mm turret for the FNSS ACV-300/ACV-15 and ACV-19 armored vehicles. Meanwhile Elbit Systems may offer a derivative of the Elbit MT30 manned turret, which is similar to the UT25 unmanned turret used by the Philippine Army. The BAE-FNSS Sharpshooter turret. Photos taken from FNSS' old website. The Elbit Systems MT30 manned turret shares the same basic structure as the UT30 unmanned turret. Photo taken from Elbit's website. Apparently the Philippine Army Technical Working Group for this project may have already finalized the technical specifications of the project, and what's left is for the procurement phase to proceed. So far there is no final confirmation if DND decided to have the procurement through Public Bidding, Limited Source Bidding, or Government-to-Government Negotiated Procurement. MaxDefense sources believe that there is still a chance that it could be procured via Public Bidding, which opens the project to anyone who can comply with the requirement. We are waiting for the the Acquisition Decision Memorandum (ADM) which will determine the mode of procurement for the project. MaxDefense will create a new portal on its website that will focus on updates regarding this project. With the Philippine Air Force given more priority in 2019, the Philippine Army would be lucky if they can push this project to start the procurement phase within 2019. If not, MaxDefense expects this project to proceed in 2020. Del Pilar-class Offshore Patrol Vessels Upgrade - Hanwha Systems Wins Tender? 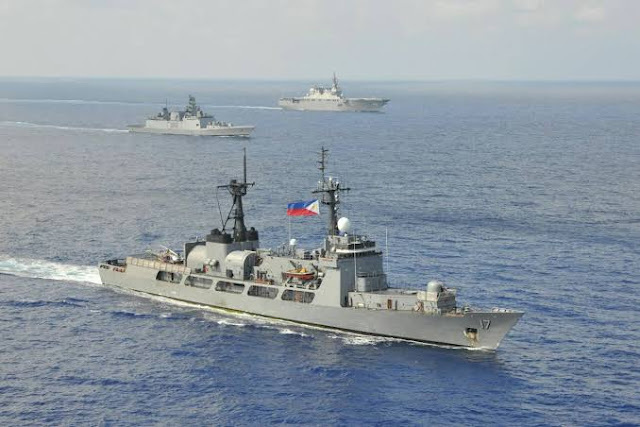 After several postponements between December 2018 to February 2019, the Department of National Defense's Bids and Awards Committee (DND-BAC), has finally successfully tendered the Del Pilar-class (Frigate) Upgrade Project of the Philippine Navy (PN), which is a Horizon 2 phase project under the Revised AFP Modernization Program. The Limited Source Bidding's bid opening appears to have been made on 19 February 2019, or two months after the original bid opening schedule of 28 December 2018. This blog entry is the first one focusing more on the Del Pilar-class (Frigate) Upgrade, as previous discussions were more focused on our own suggestions or recommendations. One of the Del Pilar-class ships, BRP Andres Bonifacio (PS-17, then FF-17) leading ships from the Indian Navy and Japan Maritime Self Defense Force on its way to Pearl Harbor, Hawaii to participate in Rim of the Pacific 2018 multilateral naval exercises. Photo taken from the Philippine Navy. With an Approved Budget of Contract (ABC) worth Php1,540,000,000.00, the scope involves the upgrade of sensor systems and combat management system of the three (3) ships of the class, namely BRP Gregorio del Pilar (PS-15), BRP Ramon Alcaraz (PS-16) and BRP Andres Bonifacio (PS-17) to make them more capable and responsive to growing maritime threats. Among the reasons the ships were downgraded in February 2019 from frigates to offshore patrol vessels was due to lack of capabilities, at least in major combat features inherent of frigates namely anti-surface warfare (ASuW), anti-submarine warfare (ASW), anti-aircraft warfare (AAW), and electronic warfare (EW). Before any improvement can be done in the ship's combat systems, it has to improve its "eyes" and "ears" first to be able to see the target, identify them properly, and guide its weapons accurately. Thus this upgrade program is the first step in improving the ship's overall capabilities. * Supply and Installation of a new Combat Management System (CMS), Hull Mounted Sonar (HMS), and Radar Electronic Support Measures (R-ESM). Based on the infographics supplied by the Philippine Navy below, these are under the "AFP Modernization Projects (CMS, ESM, HMS)"
* System Integration of the Proponent (winning bidder) Supplied Equipment with the Government Supplied (Philippine Navy) Equipment, which includes the Saab AN/SPS-77 Sea Giraffe AMB 3D radar, Identification Friend or Foe (IFF), FLIR SeaFLIR 230 EO/IR camera. These are all listed under the "US FMS/FMF Projects", as these subsystems were acquired by the Philippine Navy under cooperation with the US government, and passed through the US Foreign Military Sales (FMS) or Foreign Military Financing (FMF) programs of the US Department of Defense. * System Integration of existing ship subsystems including navigation, situational awareness, AIS, weapons and guns, countermeasures, and other systems. These existing subsystems are shown under the "Current Capabilities" portion of the inforgraphic. * Provide an Integrated Logistics Support package to support the upgrades for a certain time. Based on the schedule required by the Philippine Navy, the proponent-supplied equipment must be delivered and ready for installation within 720 calendar days (~2 years) from receiving the Notice to Proceed (NTP). That is somewhere around 2021. Installation will be a different delivery schedule, with ships no. 1 scheduled to have the integration and installation works starting 2021, and must be completed within 6 months after the Arrival Conference of the proponent-supplied equipment. It is expected that ship no. 2 will undergo the upgrade work within 2021 also, while ship no 3 will have it in 2022. 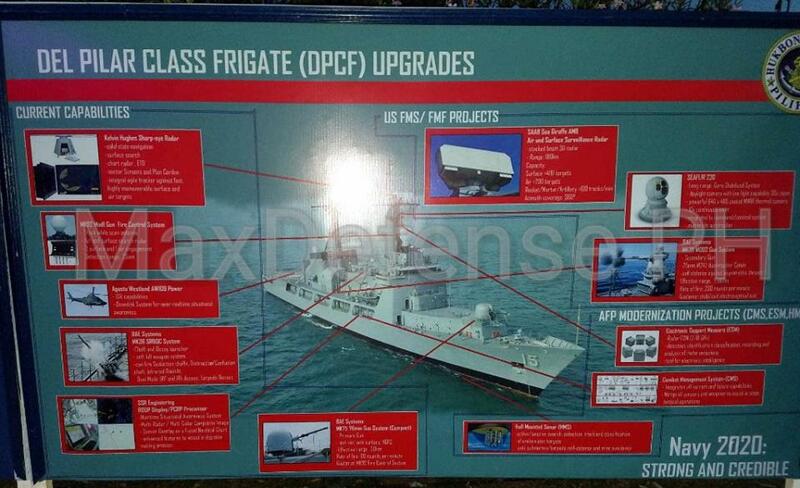 An infographic released by the Philippine Navy on the DPCF Upgrade project. Bas This current upgrade project covers the supply of the listed items under "AFP Modernization Projects"
* a world-renowned naval systems supplier and integrator involved in upgrade of warships, as well as supply and integrating sensors for new major warships around the world. * is supplying one of the most important items for integration into the Del Pilar-class, which is the US-supplied Saab AN/SPS-77 Sea Giraffe AMB 3D air/surface search radar system. * they also have a representative office in Manila, and is also tied under cooperation with Filipino marine services provider Propmech Corporation. * another globally known naval systems supplier and integrator, and is also involved in many upgrade projects of warships regionally. * has experience working with the Philippine Navy when it won the Phase 3B combat systems upgrade of two of the PN's Jacinto-class patrol vessels. * they are also represented locally by a Filipino group. * is a new player in the global scene but has been extensively involved in naval systems supply and integration works with the fairly large Republic of Korean Navy (ROKN). * was born out of cooperation between Samsung (Hanwha System's former owner) and Europe's Thales Group. Some of their products were actually developed from early-model Thales products. * currently is involved with the Philippine Navy, being Hyundai Heavy Industry's naval systems supplier and integrator of choice for the Jose Rizal-class frigates under construction in South Korea. Based on a statement made last February 2019 by the Philippine Navy's Flag Officer in Command (FOIC) himself, Vice Adm. Robert Empedrad during an interview with AFP-controlled radio station DWDD, the lowest bidder was a UK-based company. Of the three companies expected to participate in the tender, only Ultra Electronics is based in the United Kingdom. This was later on corroborated by our naval, defense, and industry sources, who all confirmed that Ultra Electronics was indeed the lowest bidder. Also, the only other bidder that submitted for the tender is South Korea's Hanwha Systems. 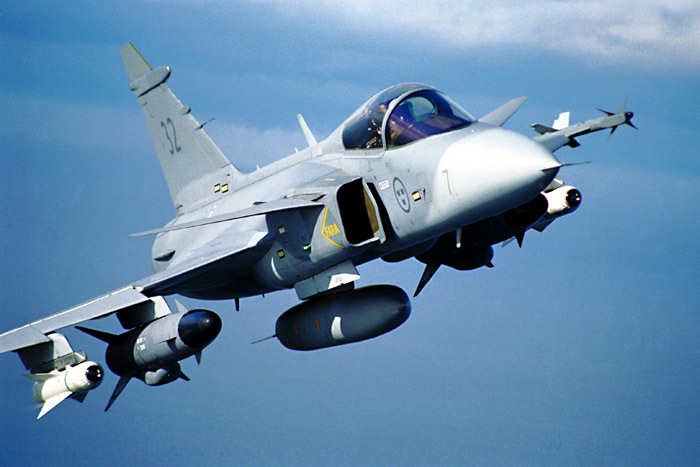 As for Saab Group, it was confirmed to MaxDefense that they did not submit a bid. No official reason was provided, although sources mentioned that it could be because Saab believes that the budget allocated for the project was too low considering the requirements being asked by the Philippine Navy. 1. For Combat Management System: the Ultra Electronics OSIRIS CMS, which is already in service with several navies. 2. For Radar-Electronic Support Measures: a variant of the UltraEAGLE ELINT system, wherein a naval variant is available. 3. For Hull Mounted Sonar: due to costs, MaxDefense believes that Ultra would be offering their lower-end model, probably the Ultra Sonar 2091 (MFS-7000) single-frequency sonar, whose technology is now more than 10 years old and was the basis for the Royal Navy's HMS for the Daring-class air defense destroyer. 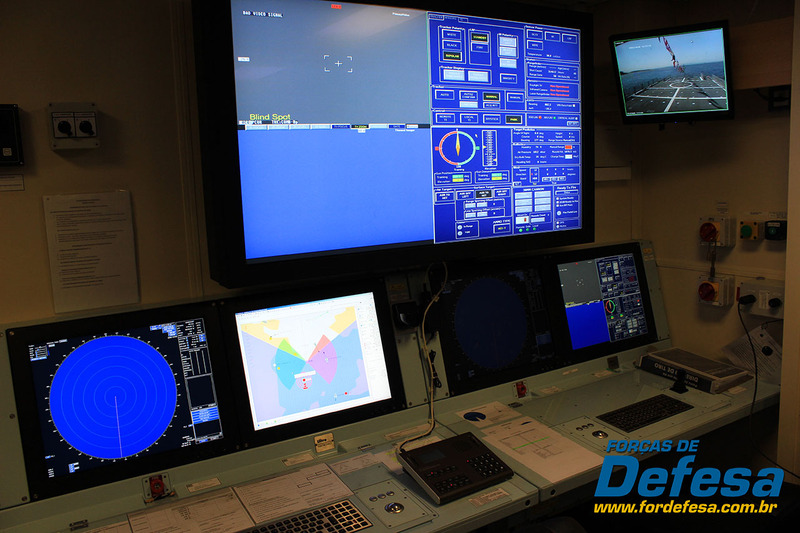 The console of the Ultra Electronics OSIRIS CMS as installed on a Brazilian offshore patrol vessel. Photo taken from Forcas de Defesa Brazilian defense website. But due to turn of events in the past 2 months, it was later confirmed to MaxDefense that Ultra Electronics was disqualified from the project. Apparently, Ultra Electronics failed the Post Qualification Inspection (PQI) conducted by the PN TWG and the DND BAC. Usually, a company could fail the PQI if it does not meet certain documentary, administrative, financial, or technical capabilities when matched against its submission during the tender. MaxDefense believes that the issue could be a technical one, as Ultra Electronics already underwent a PQI with the PN TWG and DND BAC for the Jacinto-class Patrol Vessel Stage 3B Combat Systems Upgrade project, and passed the PQI without problems. This disqualification by Ultra Electronics opens up the chance for the next lowest bidder, South Korea's Hanwha Systems, to undergo the PQI process to determine if it matches its submissions during the tender, and is eligible to undertake the project. Like Ultra Electronics, Hanwha Systems already "passed" a PQI conducted by the a PN TWG and DND BAC as part of its participation in the PN's Frigate Acquisition Project. So it is expected that Hanwha Systems would sail through the inspection process. Based on information gathered from sources, the offer made by Hanwha is mostly familiar to us since we have been discussing them since 2015. 1. For Combat Management System: the Hanwha Systems Naval Shield Baseline 2 Integrated Combat Management System, which is the same system to be used on the Jose Rizal-class frigates. 2. For Radar-Electronic Support Measures: the Elbit Systems - Elisra Aquamarine NS9300A R-ESM, similar also to the one to be installed on the Jose Rizal-class frigates. 3. For Hull Mounted Sonar: no full confirmation yet, although apparently it is not the Harris (EDO) Model 997 which was selected by HHI and Hanwha Systems for the Jose Rizal-class. MaxDefense won't release more info for now, but if our information is right, the sonar offered by Hanwha is a European-made model. Hanwha's advantage is that the systems they offered, except for the Hull Mounted Sonar, would be very much compatible to the ones installed on the new Jose Rizal-class frigates. This allows for easier and simpler logistics, training, commonality and interoperability. But the question remains on the Tactical Data Link 16 compatibility and workability of the Naval Shield BL2 ICMS, and like the previous issues on the Frigate Acquisition Project (FAP), this is a requirement of the Philippine Navy for this DPCF Upgrade. It would be noted that during the Senate Hearings on the FAP issues, as well on submitted documents by HHI and Hanwha to the PN and DND in 2016, Hanwha claims that they are on track to allow TDL Link-16 to be fully compatible with the Naval Shield BL2 ICMS by 2019. It remains to be seen if this would indeed happen, considering the first ship of the new frigates, BRP Jose Rizal (FF-150), is scheduled for delivery to the PN in less than 10 months from now. The ship's CMS should all be complete, tested, and workable before handing the ship over to the PN. 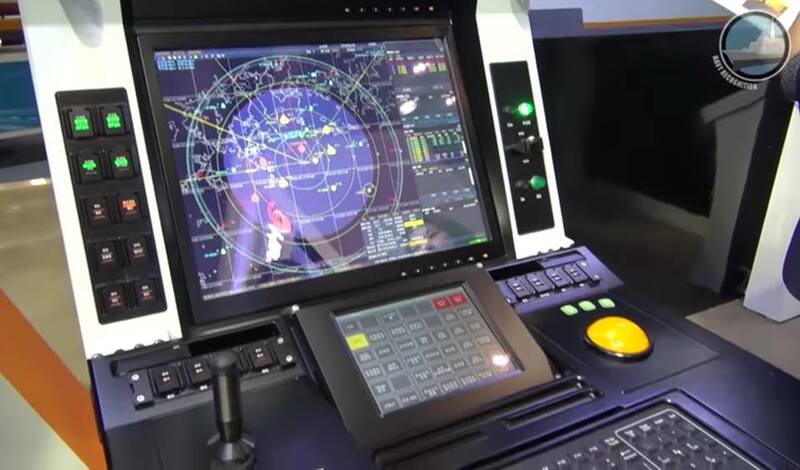 The upgraded console, apparently used for the Naval Shield BL2 ICMS as displayed in MADEX 2017. Photo taken from Navy Recognition. No formal awarding has been made yet as far as we know, although passing the PQI means that the next process was for the DND to issue the Notice of Award (NOA) to Hanwha Systems. Usually it takes as early as 1 month to as late as 1 year for the DND to release a NOA to a winning bidder, depending on availability of funds, availability of Letter of Credit (LOC) to financially support the payments, and depending on document or administrative processing. In this case, MaxDefense believes that a NOA can be released by April or May 2019, and a contract signed on or before July 2019 based on our compiled data. With the Philippine Air Force (PAF) now closer on getting their new fleet of S-70i Black Hawk Combat Utility Helicopters from Sikorsky Aircraft Corp. & PZL Mielec, its only a matter of time before the first batch of deliveries as promised by Sikorsky-PZL Mielec to the PAF and Department of National Defense (DND) as part of the delivery agreement. But there is an interesting development in the AFP Modernization that involves the Black Hawk helicopter, which was never discussed in MaxDefense before. The Sikorsky HH-60M MEDEVAC Black Hawk. On 21 March 2019, the Philippine Army (PA) celebrated its 122nd Founding Anniversary in its headquarters at Fort Bonifacio in Metro Manila. As part of the celebrations, several Army and AFP units, as well as defense companies and suppliers also set-up their booths in the plenary hall lobby. Among them was the Philippine Army's Army Aviation "Bagwis" Battalion (AABn). This is the sole aviation unit of the Philippine Army. The photo below is very important as it gives a summary of what the AABn is looking at having under its planned modernizaton, which calls for new assets to be acquired to expand its limited capabilities. 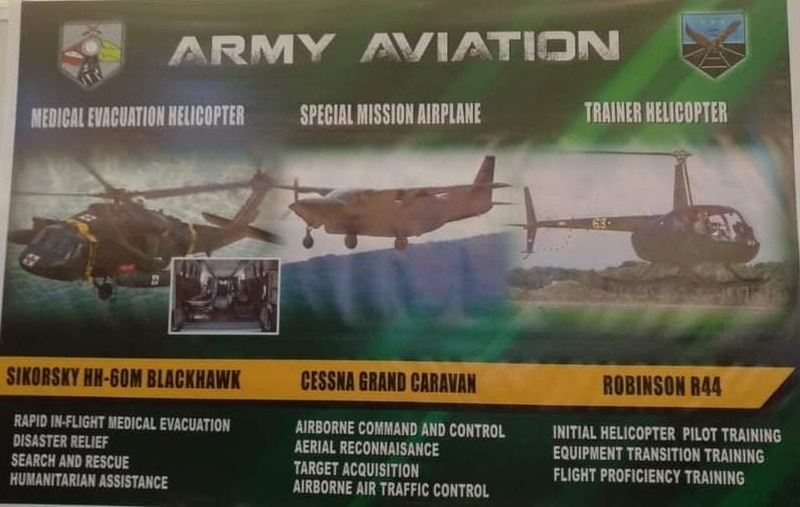 This was displayed in the PA's Army Aviation "Bagwis" Battalion booth during the 122nd Founding Anniversary celebration of the Philippine Army. Thanks to a MaxDefense contributor for providing us the photo. * For Trainer Helicopter: Robinson R-44 - for initial helicopter pilot training, equipment transition training, and flight proficiency training. The display did not mention anything on quantities to be acquired, budget, program schedule, or any other important details aside from the desired equipment. 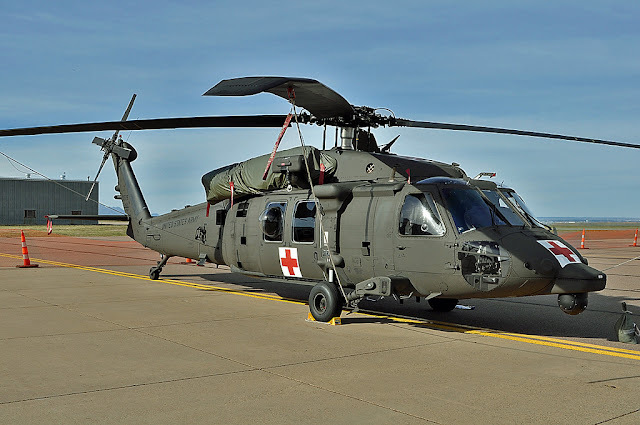 The PA AABn mentioned specifically the Sikorsky HH-60M Black Hawk, which is the MEDEVAC version of the Black Hawk helicopter currently in use by the US Army. While it uses the "HH" prefix like another Black Hawk variant known commonly as the Pave Hawk, the HH-60M is not a Pave Hawk. Instead, it is a version of the latest UH-60M US-spec Black Hawk helicopter, with additional modifications to allow Medical Evacuation (MEDEVAC) of injured troops. In short, it is a Battlefield Air Ambulance. This variant uses an integrated electronically-controlled litter system that could carry six (6) patients, as well as an onboard oxygen-generating system for onboard patient care. It is also modified to have plastic bubble windows, an integrated ECG and other medical equipment, as well as a built-in external rescue hoist. After everything else, it is essentially similar to any UH-60M Black Hawk utility helicopter. And it can still be used for other missions aside from MEDEVAC. The US Army is scheduled to receive more UH-60M beyond this decade, as it standardize it for their MEDEVAC requirements. The Sikorsky HH-60M MEDEVAC Black Hawk as used by the United States Army. Credits to the original owner of the photo. 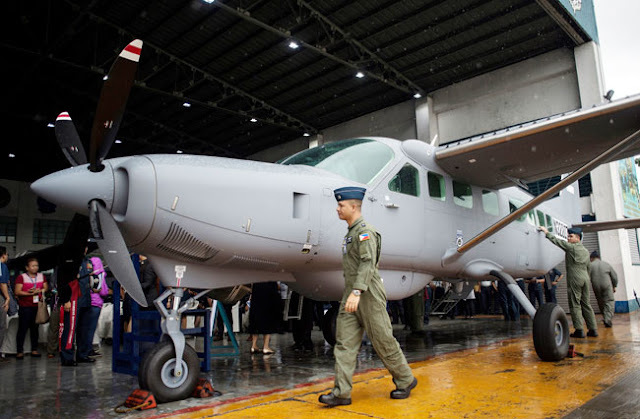 Although the PA AABn was not very specific on the Grand Caravan model or variant, MaxDefense believes that this is definitely the Cessna 208B Grand Caravan ISR, similar to what the Philippine Air Force's 300th Air Intelligence and Security Wing (PAF 300th AISW) is using. Based on the PAF's Grand Caravan ISRs, the aircraft are equipped with air surveillance systems like an Electro-Optical/Infra Red (EO/IR) camera, battlefield communications systems, and other equipment. It can be used as a battlefield "eye in the sky" where it has a bird's eye view of what's happening on the ground, allowing it to provide tactical information to the units on the ground and in the command post, while also providing coordination with other units. Based on the contract involving the PAF's Grand Caravan ISRs, the US government paid almost US$9 million to upgrade each of the new aircraft to ISR-capable platforms with the L3 Wescam MX-15 EO//IR camera, Harris RF-7800M-MP and RF-7800H-MP networking and high frequency military radios, and other related systems. This is on top of the aircraft platform's cost. The Philippine Air Force has been operating their Cessna 208B Grand Caravan ISR aircraft since 2017, and its possible that the Philippine Army is also planning to having similar aircraft of their own. The PA AABn could easily cross-train and qualify using the PAF's aircraft and assets should they become serious in acquiring similar platforms. Photo taken from and credited to Agence France Presse (AFP). The introduction of a training helicopter is actually the basic requirements for any budding air arm that will focus on operating a fleet of helicopters. 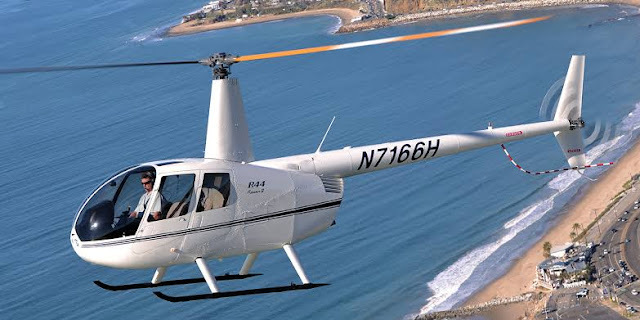 In this case, the AABn may have chosen the Robinson R44 made by the Robinson Helicopter Company of Torrance, California. The R44 is commonly used as a trainer helicopter by several military air arms, and is also in use by the Philippine National Police and several private companies and aircraft owners in the country. It is cheap, easy to fly, reasonably easy to maintain and sustain, and support for the helicopter is locally available. Selecting it as the future training helicopter of the Philippine Army makes sense based on the attributes above, although MaxDefense believes that cost may have also driven the selection. MaxDefense believes its more practical to get a slightly larger and more expensive helicopter which it could use not just for training but also for other non-combat use. The Robinson R44 Raven II is commonly used as a trainer helicopter by flying schools and military air arms. How Accurate Can Wish Lists be? While this is obviously a "Wish List" rather than an actual acquisition program, it is normal for a service branch to post such when it is at least 50% confident that it may happen. Before the Philippine Army Army Aviation Battalion posted the photos of their desired assets to be acquired, MaxDefense believes that they may have already made their homework, and was already able to conduct a market study, and even received information from manufacturers and suppliers of similar type of aircraft. It is highly possible that these selected aircraft were based on the studies and deliberation made within the unit's Technical Working Group (TWG) and even the Philippine Army's senior leadership as well. Its just a matter of submitting the recommendation of the Philippine Army leadership to the DND for such plan to move further from just planning. The requirement for training helicopters, specifically the Robinson R44 only shows that the PA AABn is committed now to create its own helicopter fleet that will require constant training of personnel for helicopter flying. 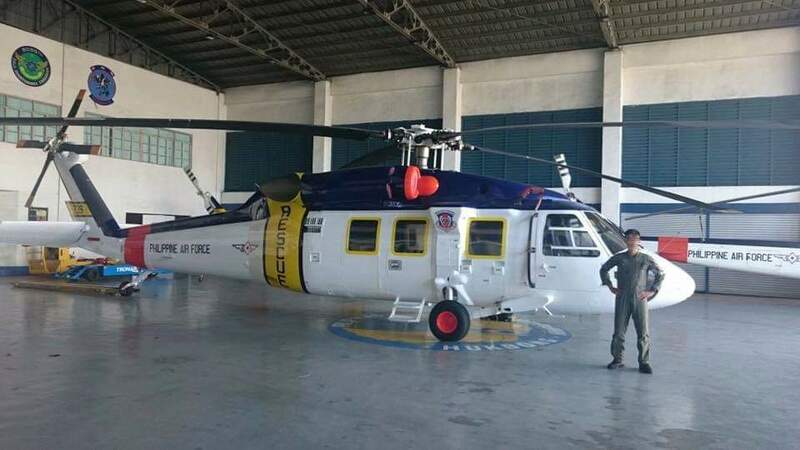 If the PA AABn was only interested in flying a few helicopters, they could have just cross-trained larger military aviation units like the Philippine Air Force, or even the Philippine Navy's Naval Air Group (PN NAG), both of which have training programs for helicopter training. Thus, MaxDefense believes that the PA AABn may not stop with the helicopter requests they have shown on the poster, and may even ask for more helicopters for other purposes in the future. Previous RAFPMP Horizon 1 to 3 plans submitted by the Philippine Army in the past actually plans for the AABn to be expanded into a regiment separate from the Mechanized Infantry Division, and with its own Multi-Purpose Medium Lift Helicopters, Armed Reconnaissance Helicopters, and Light Attack Helicopters to provide support to other PA ground units. These remains to be seen though if such plans can be made possible even during the Horizon 3 phase of the Revised AFP Modernization Program. These plans are ambitious although attainable if only the Philippine government provides the support the PA and AFP needs for their modernization plan. The Philippine Army's Army Aviation Battalion may also look at the Enstrom 480 as an alternative to the Robinson R44. 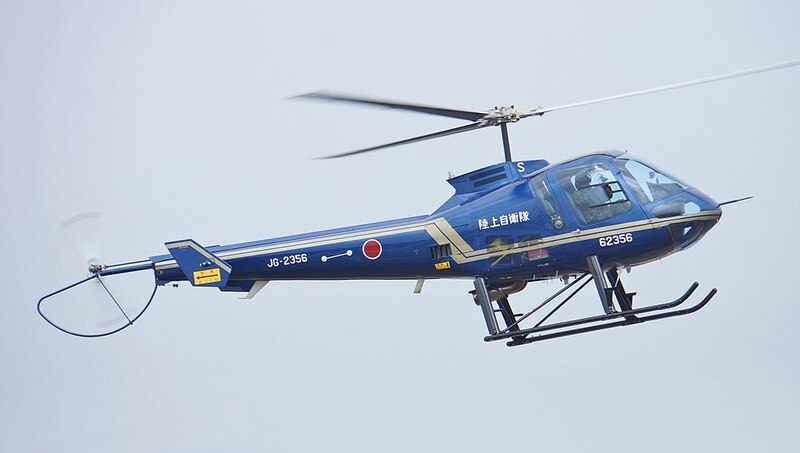 The Enstrom 480 is used as a training helicopter by the Japan Ground Self Defense Force (JGSDF) and the Royal Thai Army (RTA). Speaking of helicopters, selecting the Sikorsky HH-60M MEDEVAC Black Hawk as its future Combat Air Ambulance makes sense, considering the Philippine Air Force is on its way to standardize the Black Hawk as its new combat utility helicopter. 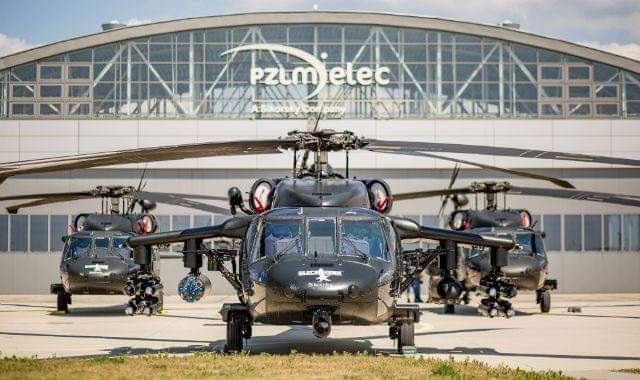 Although they may be made by different factories (PAF's S-70i Black Hawk is made by PZL Mielec in Poland, while the HH-60M is made by Sikorsky's US plant), it shares similar parts and has similar attributes. MaxDefense's only concern is the cost, since the US-made Black Hawk, especially the latest one may cost significantly higher than its Polish-built sibling, unless if the Philippine Army, and by extension the DND are planning to request these helicopters from the US as part of their annual US Military Assistance program. It is only logical as well that should the PA AABn look for a combat utility helicopter or special operations helicopter, it may just look again at the Black Hawk family. It won't be surprising if the PA AABn also request for Black Hawks for a possible future requirement for Combat Utility Helicopters. Credits to owner of photo. As for the Cessna 208B Grand Caravan ISR, MaxDefense also believes that the PA AABn is also bound to receive some from US Military Assistance program, especially that there are indeed talks within the DND that a request for more of these aircraft was made with its counterparts in Pentagon. If the Philippines gets an allocation of even just 3 aircraft, the PA AABn may be able to get at least 2 aircraft out of the total. This would at least allow 1 aircraft to be available at any time, and 1 aircraft to be in maintenance at any given time. Of course if the PA AABn can get more, the better. The PA AABn may also opt to purchase more Cessna 208B Grand Caravans in standard fit on its own without relying from US Military Assistance, to replace its old fleet of Cessna 421 and Beechcraft Queen Air, all of which are probably non-operational at the moment. These are used for air transport requirements of the Philippine Army without relying on air transport services from the Philippine Air Force. 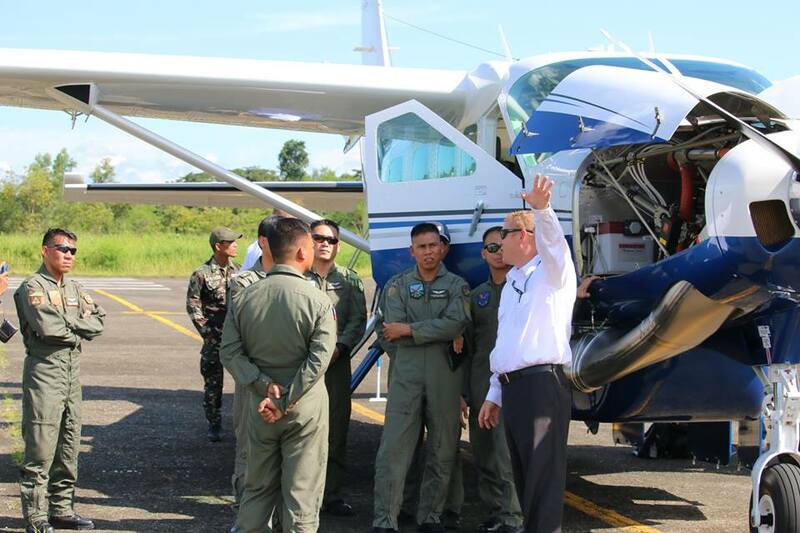 It would be worth remembering that in 2015, Cessna brought their 208B Grand Caravan aircraft to Fort Magsaysay in Nueva Ecija, the PA AABn's home, to demonstrate the aircraft to the unit's leaders and pilots. MaxDefense posted this in its Facebook page back then, which can be accessed HERE. Philippine Army AABn officers getting briefed on the Cessna 208B Grand Caravan utility aircraft during a demonstration in Fort Magsaysay in September 2015. Even before then, the PA AABn has already set its sights on the Grand Caravan as its potential future utility aircraft. Photo taken from PA AABn's Facebook account. Since there is not much available information on these plans except for the information gathered during the 122nd Founding Anniversary of the Philippine Army, as well as limited information from previous Horizon 1-3 modernization plans, it may take some time before MaxDefense would be able to provide more details for these projects. b. They could push hard and make it happen as part of the proposed 2nd List of Horizon 2, which is already being prepared by the AFP in case there are more funds available from the government within the 2019-2023 timeframe. c. Majority of the acquisitions will be made by the US government on behalf of the Philippine Army as part of US Military Assistance program. MaxDefense believes that, in the case of the HH-60M Black Hawk and Cessna 208B Grand Caravan ISR, there is a strong chance that the US government may indeed assist the Philippine Army in one way or another. As mentioned earlier, these projects won't happen soon so we'll have to wait longer. The Philippine Air Force (PAF), through its former Commanding General Lt. Gen. Galileo Gerard Kintanar Jr. announced in late 2018 that the Technical Working Group (TWG) for the Combat Utility Helicopter (CUH) acquisition project under the Horizon 2 phase of the Revised AFP Modernization Program (RAFPMP) has selected the Sikorsky S-70i Black Hawk as its top choice. This was after the project's TWG evaluated it against other competitors which include the Leonardo AW139M, Korea Aerospace Industries KUH-1 Surion, Russian Helicopters Mil Mi-171 Hip, among others. The Sikorsky PZL Mielec S-70i Black Hawk International. Photo c/o Lockheed Martin. The Combat Utility Helicopter acquisition project under the Horizon 2 phase calls for the supply and delivery of 16 units of new Combat Utility Helicopters, including the specified Integrated Logistics Support (ILS) package that includes the spares and logistics support, training and conversion requirements, and mission essential plus support tools and equipment. The Approved Budget for Contract (ABC) is worth Php12.1 billion, or around US$230 million. It remains to be seen if the budget will increase to allow the PAF to be able to pay for its selected product. 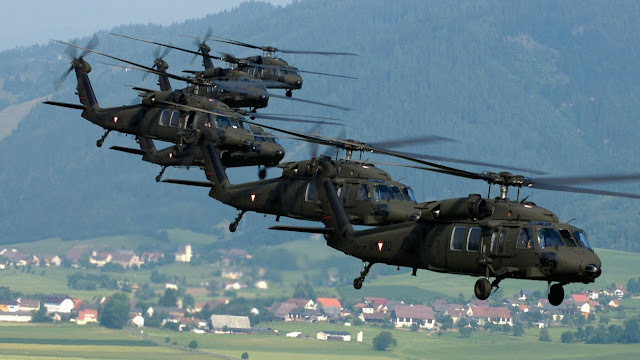 Sikorksy S-70 Black Hawk helicopters of the Austrian Air Force. The PAF has selected a newer version of the helicopter to be its next Combat Utility Helicopter. Photo taken from Photo Nexus. It did not take long for Defense Sec. Delfin Lorenzana to back Lt. Gen. Kintanar's announcements, that the Department of National Defense (DND) supports the PAF's selection of the American-designed helicopter for the CUH acquisition project. He even mentioned that the Black Hawk is a proven platform, in use by the US Army and many other militaries around the world. So it is actually surprising that, its already 4 months and no announcement has been made by the DND on the formal awarding of the project to the Black Hawk's manufacturer Sikorsky, or its mother company Lockheed Martin. After the PAF and DND confirmed the selection of Sikorsky's S-70i Black Hawk as its top selection, the TWG and the DND's Bids and Awards Committee (DND-BAC) proceeded with the Post Qualification Inspections (PQI) to determine if Sikorsky and its Polish subsidiary PZL Mielec both comply to their submitted documents and requirements, and if their product complies with the technical specifications. As early as January 2019, MaxDefense was informed that Sikorsky & PZL Mielec did pass the PQI by the PAF TWG and DND-BAC, thus it is eligible to proceed with the project and receive a Notice of Award (NOA) from the Philippine parties. The Sikorsky-PZL Mielec S-70i Black Hawk. Photo taken from and credited to Rob Lovesey @ Flickr. After a long wait, finally there is good news on this project. The event may happen anytime, and could even be as early as within today if the DND has made the entire process quicker than expected. Drafting the contract may take time, as it involves both parties to agree on the contents of the contract, including the clauses and appendices on requirements, schedules and programs, inclusions and exclusions, items for clarification, any side-agreements, warranties and after sales support, modifications to suite the end user, and other necessary requirements. Based on experience using the PAF's previous contracts, it may take from as short as one (1) month from NOA release, to as long as almost a year to complete. In this case, MaxDefense expects the contract to be ready for signing within 2 months from NOA release. MaxDefense was informed that the deal will be a Direct Commercial Sale (DCS) mode of procurement instead of the lengthier Foreign Military Sales (FMS) with the US government, and will mostly involve PZL Mielec being the manufacturer of the helicopter. It would also be remembered that the PAF and the DND confirmed during the Defense Budget 2019 hearing with the Senate that training of pilots will be conducted with Sikorsky in Florida, USA. This is despite the helicopters and aftersales support being provided by its Polish subsidiary PZL Mielec. This allows for easier training of PAF air and ground personnel due to the use of English as medium of instruction, which was said to be a problem when the PAF previously awarded a similar CUH acquisition contract to PZL Swidnik for the W-3A Sokol utility helicopters under the old RA7898-supported AFP Modernization Program. Another benefit that is worth raising here is that the PAF is actually a long time user of the Sikorsky S-70 Black Hawk, as it has been one of the first Black Hawk operators outside the US when it acquired a couple of S-70A-5 Black Hawk from Sikorsky in the mid 1980s. At least one of the Black Hawks remain in service with the PAF as a Search and Rescue platform of the PAF's 505th Search and Rescue Group. The PAF is a long time user of the Sikorsky S-70A Black Hawk. One unit remain in service with the 505th Search and Rescue Group. Photo taken from Defense of the Republic of the Philippines Facebook page, credits to Patrick Joseph. The PAF and DND also confirmed during the said hearing that Sikorsky-PZL Mielec has committed to deliver the first batch within 6 months. MaxDefense believes that this timeframe is based on the Opening of the Letter of Credit, which is usually the case for most AFP modernization projects. MaxDefense will provide more updates regarding this project as more information comes in. Considering that the project is moving forward without any more expected roadblocks from people with influence from now on.